GENEVA - A U.N. report that shows North Korean leaders use murder, torture, slavery, sexual violence and starvation to hold their grip says the Communist State considers the spread of Christianity a particularly "serious threat." This is because "it ideologically challenges the official personality cult and provides a platform for social and political organization and interaction outside the State realm," says the report. The office of the Uinted Nations High Commissioner for Human Rights on Monday released the "Report of the commission of inquiry on human rights in the Democratic People's Republic of Korea." It said, "Christians are prohibited from practising their religion and are persecuted. "People caught practising Christianity are subject to severe punishments in violation of the right to freedom of religion and the prohibition of religious discrimination." U.N. High Commissioner for Human Rights Navi Pillay on Tuesday welcomed the report and said "its findings need to be treated with the greatest urgency, as they suggest that crimes against humanity of an unimaginable scale continue to be committed in the DPRK." 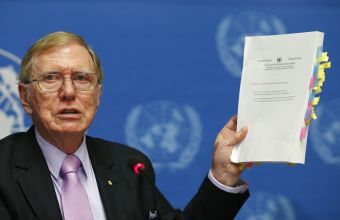 (Photo: REUTERS / Denis Balibouse)Michael Kirby, Chairperson of the Commission of Inquiry on Human Rights in North Korea holds a copy of his report during a news conference at the United Nations in Geneva February 17, 2014. North Korean security chiefs and possibly even Supreme Leader Kim Jong-un himself should face international justice for ordering systematic torture, starvation and mass killings bordering on genocide, U.N. investigators said on Monday. "In January 2013, I urged the international community to put much more effort into tackling the human rights situation of people in DPRK," Pillay said. She said the "historic report, which sheds light on violations of a terrifying scale, the gravity and nature of which – in the report's own words -- do not have any parallel in the contemporary world. There can no longer be any excuses for inaction." "Insufficient attention was being paid to the kind of horrific and sustained human rights violations that are reported to be taking place on an ongoing basis in the DPRK," Pillay said. The 372 page report has a section dealing with "Religious Persecution" that also gives the history of Christianity in the isolated Communist country where churches had thrived before the events of 1950-1953 civil war that left it a divided land. Commentators have said that the report does not reveal new atrocities by totalitarian North Korea, but that its scope is broad and that it will stimulate debate at the United Nations. North Korea said that the United Nations report on its human rights record was based on material faked by hostile forces backed by the United States, the European Union and Japan, Reuters news agency reported. A statement sent to Reuters Pyongyang's diplomatic mission in Geneva said that the Democratic People's Republic of Korea "categorically and totally rejects the report," drawn up by a three-member Commission of Inquiry. The report says, "Apart from the few organized state-controlled churches, Christians are prohibited from practising their religion. "Christians caught practising their religion are subject to severe punishment in violation of the right to freedom of religion and the prohibition of religious discrimination." North Korea's constitution provides for freedom of religion in article 68. It is a qualified right as approval must be sought for the construction of religious buildings and the holding of religious ceremonies. It further provides that, "Religion must not be used as a pretext for drawing in foreign forces or for harming the state and social order." The report notes that Christianity has a long history in Korea with first contacts dating back to the 17th century. "It gained particular traction in the North, and Pyongyang was sometimes described as the 'Jerusalem of the East.'" Cheondogyo, a religion blending elements of Confucianism, Taoism and Buddhism emerged in the 20th century and also gained a large number of followers. Christian Solidarity Worldwide quoted an estimate of more than 28 percent of Korea's population that had a religious belief in 1950. The 1950 Yearbook of the Workers' Party of Korea placed the figure at almost 24 per cent. The report says that based on figures provided by North Korea to the U.N. Human Rights Committee, it is estimated that only 0.16 percent of the population followed a religious belief in 2002. "Basically, according to official statistics, there were approximately 38,000 DPRK nationals who were religious believers in 2002 compared to over 2 million in 1950 (noting that in 1950, the entire population was reported to number 9 million, compared to approximately 23 million in 2002)." 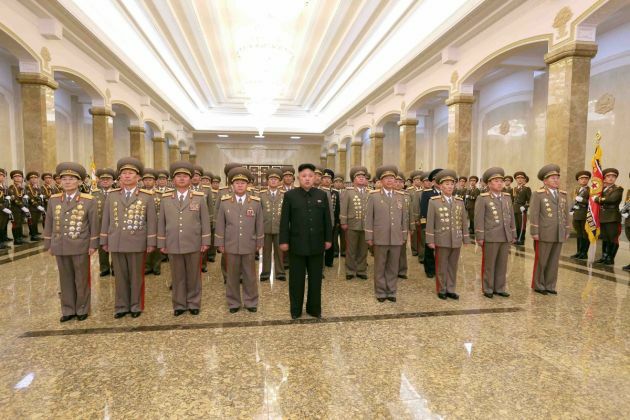 "Children are taught to revere and idolize Kim Il-sung, Kim Jong-il, and now Kim Jong-un. Plaques with slogans, posters and drawings expressing gratitude to the Supreme Leader are found in kindergartens irrespective of the children's ability to fully comprehend these messages. The commission had information that religious persecution in the North Korea began before the Korean War. "While the rhetoric was that of conciliation and unity with guarantees of religious freedom, a parallel message being issued was that religious people are pro-imperialist and pro-feudalist," said the report. It said religious oppression is said to have been divided into four phases "(1946-1950: Pre-Korean War; 1950-1953: Korean War; 1953-1971: pre-Kimilsungism movement; 1972-present: era of Juche)." The Korean War and pre-Kimilsungism movement periods hav been described as the most vicious in the persecution of religious believers. "Religious people were killed, exiled and imprisoned. Christians were said to have been targeted the most as the movement of Christianity was much more organized than the other religions and because of its supposed connection with the USA."